There’s a plethora of new HTML5 form input types (13 new ones to be exact) that make creating engaging and easy-to-use web forms much easier for web designers. The new HTML5 input types give us data validation, date picker controls, color picker controls, inline help text, and more in the web browsers that support them. The benefits of these new input types are tremendous for web designers. First, the new input types reduce our reliance on client-side- and server-side-scripting for validating common data types like dates, email addresses, and URLs. For mobile UI developers: You know that creating cross-platform web forms using HTML4 standards is a pain. 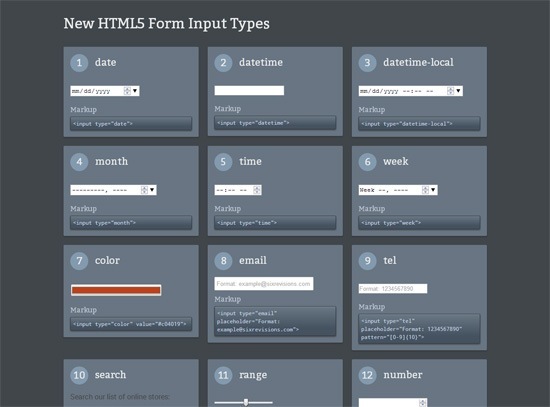 Using HTML5 form input types could make things easier. 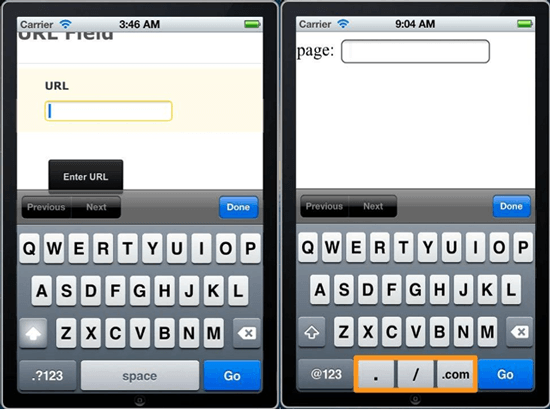 For instance, a form written with HTML5 can utilize the mobile device’s native specialized keyboards depending on what the target input type is. The difference between using HTML4 versus the HTML5 date input type. Notice how the iPhone’s native keyboard automatically switches over to its native date picker control because it knows that the target input is a date. Here’s a table of all the new HTML5 input types for your reference. Here’s a live demo of each input type so that you can play around with them. Note: This demo page will only work on browsers that support these input types, so it might not work properly when you view it. We also recommend viewing this demo page on different browsers so you can see how each browser treats these input types; they differ drastically in some cases. Let’s talk about the new input types. 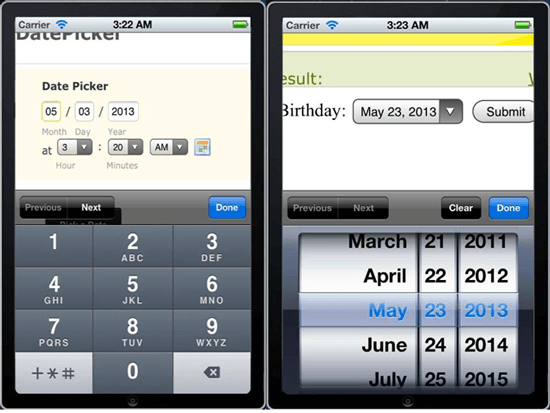 The calendar date picker is a standard UI design pattern for allowing users to enter date information in web forms. This is useful for asking users to enter their date of birth or credit card expiration date. This input type is designed to take in a global date and time string. This input type is for a local date and time string. If you want to allow users to enter a month, this is the input type to use. If you want to allow users to enter a week (such as the 31st week of 2013) this is the input type to use. This is for inputting the time in the the day. Some browsers will use military time by default (e.g. 16:00), while others use the AM/PM format (e.g. 4:00PM). The color picker UI design pattern is a way of allowing users to choose a color. The color input type gives you a form input control for a picking hexadecimal color value. Some browsers (like Safari) won’t show you a color picker UI though, they’ll just check whether or not the data is a hexadecimal color code (e.g. #000000). In HTML5-compatible browsers, this input type is set to validate the entered data for the correct email address syntax. This input type is ideal for taking in phone numbers. The search input type is meant to be used with a data set such as the datalist HTML element or the results of querying a MySQL database. It searches the data set for a match, and also gives you a list of suggestions as you type (which is called the autocomplete user interface pattern). This input type is another way to get number-related data from users. By default, it has a slider user interface. This input type restricts data entries only to numerical values. If you include min and max attributes, it also validates the data input to make sure the number is between the min/max values. Theis input type validates the entered data to make sure that it follows the standard URL format. 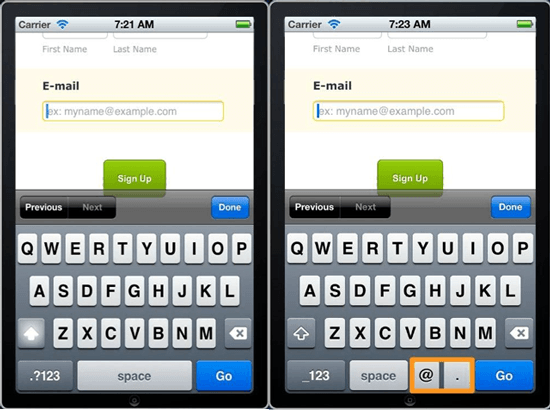 These additional input types in HTML5 help us build user-centered web forms easier. The modern web designer no longer needs to break his/her back in order to enable more complex data input patterns. The times are changing for all of us. Let’s not forget to update our forms to match.